A previous study on swine with uncontrolled haemorrhagic shock who were given intraosseous (IO) hypertonic saline demonstrated a high rate of complications such as soft tissue necrosis and venous thrombosis(1). This led to a recommendation of caution in patients requiring hypertonic saline via the intraosseous route(2). However the results were not replicated in other studies. A recent animal study, again in swine, compared IO infusion of 250 mL of 0.9%, 3% or 7.5% of hypertonic saline(3). Detailed follow up 5 days post infusion showed normal ambulation and tissue morphology as assessed by a pathologist who was blinded to the infusion fluid used. The authors cite several likely methodological reasons why the former study showed tissue necrosis, which they had attempted to address in this one. For example, in this study fluoroscopy was used to confirm proper placement of the IO needle before and immediately after infusion, which ensured proper placement of the needle and no extravasation of fluid. It is easy to conceive that extravasation into muscle in a shocked patient could increase the risk of tissue ischaemia, compartment syndrome and muscle necrosis. A growing experience of military and civilian cases as well as the small amount of human data in the literature(4) suggest that intraosseous hypertonic saline is safe and effective, but one should always pay close attention to the limb and be on the lookout for signs of extraosseous leak, such as limb swelling. 1. Alam HB, Punzalan CM, Koustova E, Bowyer MW, Rhee P. Hypertonic saline: intraosseous infusion causes myonecrosis in a dehydrated swine model of uncontrolled hemorrhagic shock. The Journal of Trauma: Injury, Infection, and Critical Care. 2002 Jan;52(1):18–25. 3. Bebarta VS, Vargas TE, Castaneda M, Boudreau S. Evaluation of Extremity Tissue and Bone Injury after Intraosseous Hypertonic Saline Infusion in Proximal Tibia and Proximal Humerus in Adult Swine. Prehosp Emerg Care. 2014 Oct 2;18(4):505–10. 4. Luu JL, Wendtland CL, Gross MF, Mirza F, Zouros A, Zimmerman GJ, et al. 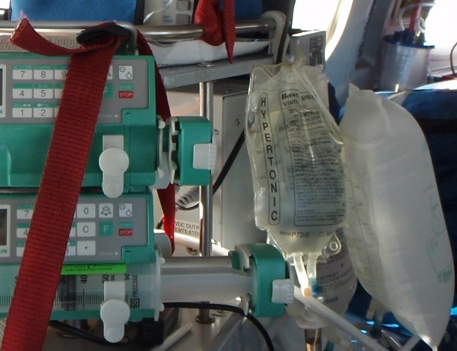 Three-percent saline administration during pediatric critical care transport. Pediatr Emerg Care. 2011 Dec;27(12):1113–7. This entry was posted in General PH&RM and tagged drugs, fluid, neuroprotection. Bookmark the permalink.